Persistent, ‘honking’, retching, horribly unpleasant........... Kennel cough can last for weeks, and can prove fatal in susceptible individuals. It’s also the most widespread infectious disease of dogs in Britain today. And of the 65,000 dogs who were diagnosed with the condition last year¹ , most had picked it up in parks, streets, classes, shows...in fact, all sorts of situations that had nothing whatsoever to do with kennels². Is kennel cough a risk in my area? Since 2008, UK vets have been sharing data to monitor the incidence and outbreaks of pet disease in the UK. It’s called the CICADA Survey, and you can see all its findings here. This map from the survey shows the most recent data on Kennel Cough. As you can see, it remains widespread throughout the country. So is my dog protected against kennel cough? Protection against kennel cough is NOT NORMALLY included in your pet’s routine annual vaccinations. However, it can be added relatively easily - just a small drop of liquid applied to one nostril. This simple ‘intranasal’ vaccine only takes seconds to administer, and yet it will protect your dog for at least a year. What is kennel cough and what are the clinical signs? Kennel cough – also known as infectious bronchitis – is a complex respiratory infection, caused mainly by a bacteria called Bordetella bronchiseptica and the Parainfluenza virus. 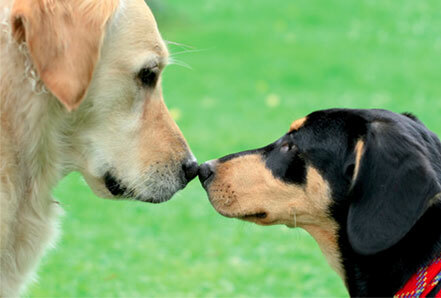 Once your dog has been exposed to infection, it will generally take 5-7 days before signs of disease are seen. Kennel cough usually causes a dry, hacking cough, runny nose and sometimes sneezing. The gagging cough and retching associated with this disease are upsetting for your dog and you. Depending on its severity, the signs of infection can last from a few days to several weeks. However, even after the coughing has stopped your dog can remain infectious for up to three months. If my dog catches kennel cough, can I treat it? Unfortunately, by the time your dog has started coughing, the disease will already have damaged its respiratory system. Therapies such as anti-inflammatory drugs and cough suppressants are often only minimally effective and should only be used under strict veterinary supervision. Kennel cough is caused by both bacteria and viruses, so antibiotics can sometimes help reduce disease severity. Often, though, they have little impact on symptoms. As with any serious disease, prevention is always better than cure. Effective intranasal vaccines are available against the most significant causes and can be administered routinely alongside your pet’s normal annual boosters.